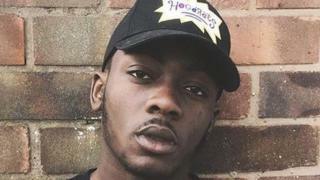 A club where the Specials singer Neville Staple's grandson was fatally stabbed has been ordered to close. Fidel Glasgow, 21, died in hospital after the stabbing outside Club M in Croft Road, Coventry, on Saturday morning. Coventry City Council's Licensing and Regulatory Committee said on Wednesday the club had been told to close until a full hearing was held. A full review of the club's licence will be held within 28 days, the council said. On Wednesday, Mr Staple appealed to bystanders who "tried to step in" and stop the attack. West Midlands Police said 100 people were outside Club M at about 05:20 BST when Mr Glasgow was injured. Councillor Patricia Hetherton, chair of the committee, said: "We have resolved to suspend the premises' licence of Club M pending a full review hearing." She added: "The committee considered the licensing objectives, which include crime and disorder and public safety and felt that the premises pose a serious risk to the public if they remain open." The committee also heard there had been reports of previous disorder associated with the club and reports of breaches of licence conditions. Tributes to Mr Glasgow, the son of Mr Staple's daughter Melanie, have been left at the scene. Atikou Diallo, 23, is accused of wounding a 23-year-old man during the disturbance. On Tuesday, he was remanded by magistrates to appear at Birmingham Crown Court on 2 October.